Personalized gifts are the best ones!! Being in the South, I love a good monogram!! 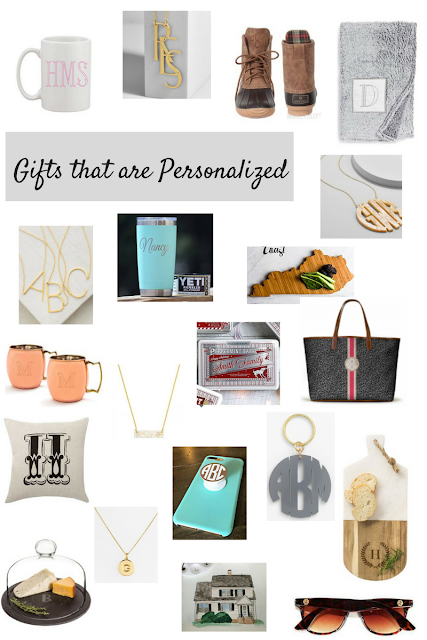 And nowadays, you can monogram anything or find your initial on anything!! A gift that was "made" for someone makes it a tad more special, don't you think? But you do have to hurry and order. Some monogrammed items and personalized gifts can take a couple weeks to make and then ship. This necklace is my all-time favorite necklace. I love the XL size and it comes in a huge selection of colors. This one is on my wish list!! It's unique and different. While I'm talking favorites, this tote is the one I carry the most!! It's a great size without being bulky and has pockets inside!! The tote is totally customizable with so many options. Check their site here for their other women and men options. And 1 last thing I need to mention. How about a custom made water color picture? I was gifted this and love how it turned out. Kimberlee Watson Art did a fantastic job and added special details (my puppy!). It will make an incredible Christmas gift for anyone! The necklace is so beautiful (your favourite one).